If you’re a designer, you work to communicate and convey meaning. So it’s important that you understand the mechanisms by which things and ideas acquire meaning; more than any other factor, your grasp of these fundamentals determines your ability to communicate effectively. Without fundamentals, you will flounder when faced with complex design challenges or constraints. Today, as always, issues of style and popular convention occupy the attention of many, and may distract us from the essentials of our craft. This is especially true for those of us who did not come to web design from a formal design or art education, so I want to take this opportunity to examine what I deem to be the most important fundamental tool for conveying meaning. Before we move on to specifics, though, let’s briefly examine the whole set of fundamentals. These basics of creative communication are consistent across art forms: painting, music, dance, acting, poetry, design, and all other artistic endeavors. I divide them into two categories: vocabulary and grammar. Artistic Vocabulary: The vocabulary of artistry is found largely within the fundamentals of line, form, color, and texture. These elements form the content of our communication. Various forms of these elements have widely understood connotations; some universal and some cultural. For instance, angular lines and forms are generally indicative of strength, speed, and masculinity, while rounded lines and forms are generally associated with softness, slower tempo, and femininity. Artistic Grammar: Communicative grammar is generally defined by contrast, balance, harmony, and distribution. These are the building blocks of composition, and they help convey context and manipulate relationships among content elements. Despite the importance of these fundamentals, the language of art and design is no different from any other language in that the rules of its vocabulary and grammar do not fully define it. Moreover, most of the rules of language have exceptions, and some creative modes of communication make little or no reference to rules. Every language is lent nuance, style and character by the way that each individual uses it, and there are exceptions for every grammatical rule. Yet, no language succeeds without structure. The fundamentals of communication are always relevant and necessary as reference points. Without the essentials, communication, be it verbal, written, graphic, musical, or physical, is impossible. In fact, those creative modes of communication mentioned earlier are only meaningful by how they contrast with widely understood reference points. These widely understood reference points get their meaningful essence the same way that everything else does: through contrast. Design is largely an exercise in creating or suggesting contrasts, which are used to define hierarchy, manipulate certain widely understood relationships, and exploit context to enhance or redefine those relationships”¦all in an effort to convey meaning. Contrast is important because the meaningful essence of any thing is defined by its value, properties, or quality relative to something else. That’s right: nothing has much meaning by itself, which is one reason why design is important. The function of contrast in defining meaning can be explained by comparing fundamental opposites: dark/light, soft/hard, fast/slow. Examples like these are useful because everyone understands the extremes they imply, but while there are extremes, there are no absolutes. The values are merely relative. For instance, a cheetah is generally considered to be fast. But a cheetah is quite slow compared to a jet airplane. So saying “a cheetah is fast” is only meaningful when some relevant context is also communicated or assumed. 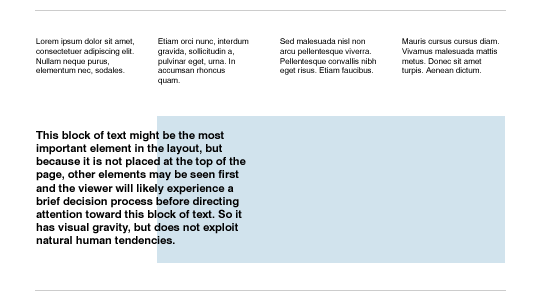 Likewise, stating that “element X in the page layout is important” is only meaningful when the relative importance of that and all other elements has been established. In other words, every element on the page you’re designing has to be positioned, styled, sized, or otherwise distinguished in accordance with its specific importance and place in the overall communicative objective. If you neglect even one component, it may work to subvert your entire effort. In addition to defining meaning and relationships, contrast is closely tied to human perception and survival instincts, as we’ll examine later, and this makes contrast a powerful and essential tool for designers. Simply put, contrast is at the root of almost everything you’ll accomplish with design. The primary forms of contrast include size, position, color, texture, shape, and orientation. In a layout, contrast helps lead the reader’s eye into and through your layout. Each component of the page, graphic, textual, or interactive, has a job to do, and each of those jobs falls within a hierarchy that’s specific to the project at hand. Furthermore, each component is but a piece of the overall project message and objective. With creative uses of contrast, you can influence user choices and compel specific actions. Page elements must not, of course, be designed or organized haphazardly. Content must be intelligently composed, and composition is defined by the information hierarchy, which is defined with, you guessed it: contrast. For instance, let’s say that you’re designing a simple web page for which the main purposes are to 1) briefly describe what the company/service does, and 2) ask visitors to create an account and start using the service. Setting visual concerns aside, let’s look at the initial copy we’re presented with for each of these information components. 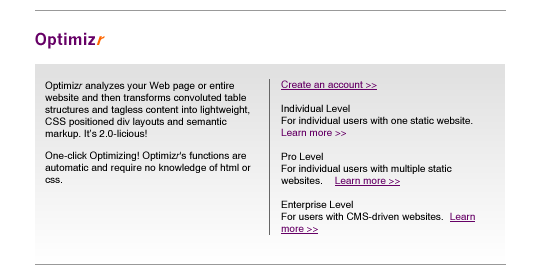 Optimizr analyzes your web page or entire website and then transforms convoluted table structures and tagless content into lightweight, CSS positioned div layouts and semantic markup. The process is automatic and requires no knowledge of html or css. It’s 2.0-licious! Optimizr accounts include Individual Level, Pro Level, and Enterprise Level. You can create an account now by clicking here. Or you can follow these links to learn more about the different account types. It’s immediately apparent that there’s virtually no stylistic contrast between these two sections of copy. But in order for this page to work, there must be a great deal of difference between them! One is information copy and the other is supposed to be action copy. Let’s try and inspire some action by making the action section’s communication style contrast with that of the information copy. Optimizr analyzes your web page or entire website and then transforms convoluted table structures and tagless content into lightweight, CSS positioned div layouts and semantic markup. It’s 2.0-licious! One-click Optimizing! 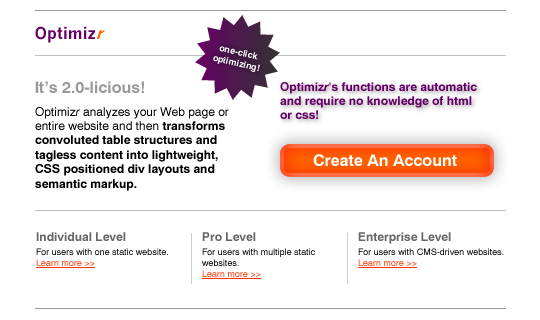 Optimizr’s functions are automatic and require no knowledge of html or css. For individual users with one static website. For individual users with multiple static websites. For users with CMS-driven websites. Now, let’s use some graphic contrast to further define the hierarchy of information and elements on the page. Here, little more than positional structure has been introduced. In this example, there is not much contrast. The logo contrasts with the content because of its color and size, and the gradient draws the eye downward. The links on the right contrast with non-link text due to color and decoration. But beyond that, there’s not much to suggest which information or elements on this page are most important. Let’s change that. Now, informational content and actionable content have been more appropriately defined and contrasted. Now there is a clear hierarchy of importance among the page elements and a more compelling call-to-action area. Important information is contrasted by size, color, or decoration and actionable elements have a common color to communicate that they’re related in some way or have a common purpose. Now that we’ve increased the contrast between elements, page visitors don’t have to read everything to know what’s most important. With a quick scan, they can grasp which information is vital and how to “get started” once they’re convinced that they need this service. As we’ll see next, this ability to communicate vital information via a quick scan is particularly important when we try to exploit natural human tendencies. It’s no secret that designers have to appreciate things most people either take for granted or are not consciously aware of. In fact, unconscious awareness is one of the primary realms we seek to manipulate through design. In order to exploit natural human tendencies and manipulate perceptions, though, we must first understand them. Designers should know that we humans habitually scan our surroundings. We may focus on one small area or item for a time, but when we change our field of vision, we first begin to visually “consume” that new view by performing a quick scan. In doing this, we unconsciously look for elements of contrast, things that stand out from the forest of mundane elements, as part of our instinctive threat-detection process. This instinct isn’t limited to spotting a crouching lion in a leafy green forest. Website visitors quickly scan a page’s layout and decide how and where they’ll begin consuming the content. If you’ve used contrast to craft a visual information hierarchy, you can compel viewers to look where you want them to. If you’ve done a really good job, with intelligent contrast, calls-to-action, etc., you can even compel them to follow a specific path through the layout. 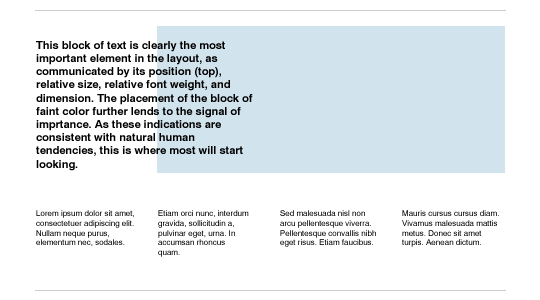 With the largest, most conspicuous text element in the upper-left area of the layout, it is clearly the most important element on the page. With the largest text element placed below other, smaller text elements, it is less clear which is the most important element on the page. It’s worth noting that people are unpredictable: and each brings his or her own objectives and whims that shape the process of encountering your designs. So despite your best efforts, it’s inevitable that your success in directing user attention will vary. Of course, it’s still your job to have a significant impact on this experience, so you’d better know what mechanisms work, and why. Newspapers can provide excellent examples of how to craft an effective information hierarchy and define the order in which readers will consume content. This typical newspaper layout illustrates a clear hierarchy of information, according to contrast. 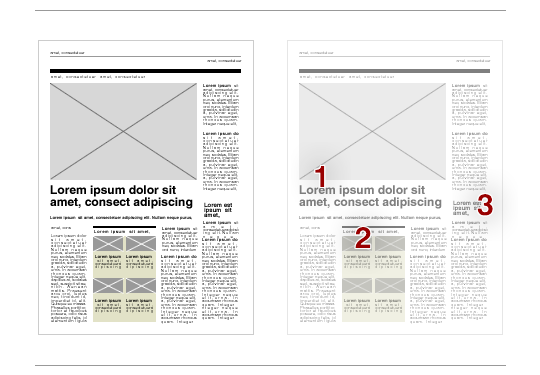 In this example of a newspaper layout, the contrast of text size, images, color, and position on the page creates a predictable order of consumption. The largest image and largest text are paired to define what will likely be seen first (1). The contrast of color and the presence of images are compelling enough to define the likely second stop for the reader’s eyes (2). Note also how that area repeats the heavy horizontal header-line, which helps to capture the reader’s attention. Because of its size, the headline on the right will probably earn the reader’s attention next (3). Understanding how the mechanisms in this example work can prepare you to craft other experiences for readers. Of course, this sort of contrast can only define the likely order of what readers will “see.” Getting them to actually read the content depends on other factors, such as how compelling the headline is and how engaging and interesting the story is, and in this realm, too, there is ample room for intelligent contrast. The information and examples presented here barely scratch the surface of this subject. Contrast is everywhere and a part of everything we see, do, experience, and understand. Look for it in your own work and beyond. Get into the habit of finding contrast in everything you see, and of calculating the information hierarchy of things in your daily experience. In other words, look deeply. This sort of habit can pay healthy dividends in your design work. Contrast is just one component of design fundamentals. Get cozy with all of them and apply them to your work first before you move on to the non-fundamentals. Your work will be better for it. As designers, we're wrongly perceived as custodians and exponents of creativity. This matters because business currently overvalues creativity. To avoid the inevitable backlash, we must lead our clients' perceptions. Andy Rutledge is such an opinionated and knowledgeable author it’s great to see him contributing to ALA – I love reading his articles. bq. This is especially true for those of us who did not come to web design from a formal design or art education. As someone with no formal education in art and design well written articles like this really help to bridge the communication gap between myself and those people I work with who _do_ have a formal education in design. Good stuff! That was a real eye opener, thanks Andy! I _do_ have a formal design education, and a lot of this I already know (although a reminder is never wrong). However, some of it was new to me and will be taken to heart. I see many print and web designers today diving deep into code, standards and aesthetics without knowing the basics of communication. Hopefully this article sheds light on the subject to some of those people! Echoing Robert Swan’s comment above, this is great reading for us non-designers. Thank you! Thanks for reading. I sincerely appreciate the nice comments. @James: I hope I can be forgiven for infusing a bit of tongue-in-cheek levity into the otherwise overly-serious article. Andy, I hit ‘submit’ by mistake there, so apologies for my message sounding so abrupt. I’m going through a bit of a Web 2.0 anger phase right now but am currently undergoing therapy to ease the tensions caused by this. @James: Don’t worry about it. 🙂 Like the man said, dying is easy, comedy is tough. It was a man who said that, right? One of my biggest problems when I started in this field was understanding these very things. It’s only taken me 10 years to become mediocre at it. Very important stuff and the article was written very well. I’m sure I’ll be referencing it in upcoming presentations. Cameron Moll has a great slide illustrating text as UI v. text as information in a presentation of his. “Go to page 40”:http://www.cameronmoll.com/speaking/2006/webjam/essential_web_skills.pdf of this PDF. My only comments about your first series of examples, Andy: the treatment you gave to the individual/pro/enterpirze buckets made them look so much like Google Ads that I automatically started to tune them out as such until I realized that there’d be no reason to have those in the example. 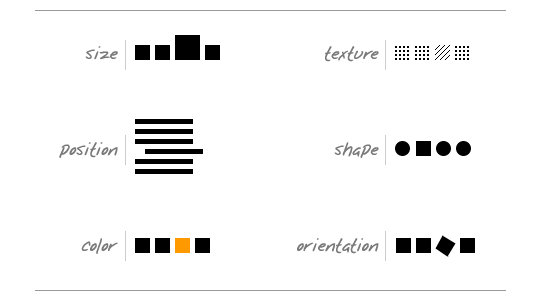 Very good article, and I especially appreciate the introduction to visual hierarchies in layman’s terms. It’s something that *anyone* working with the web should have a basic grasp of. Just the other day I was doing a competitive review of other sites with my boss, and I was trying to impress on him how other sites had better visual hierarchies than we did. Now I can have him read this article. When I started reading the article and was enticed by learning about hierarchy and turning scanners into readers I was excited! Then I click over and was taken back by a lot of plain text after scrolling for a bit.. I almost laughed, then I realised it was a much longer article than I had anticipated, and had grphics showing some of the points that I had scanned over. Which did indeed make me back up and read more on each point. The graphics really helped solidify what I was trying to picture in my mind. Thank you, several great lessons in one! Thankyou very much for the excellent article Andy. As someone with a strong technical background but little-to-no training in graphics-design resources dealing with this side of thing are always greatly appreciated and don’t seem to be available in abundance. As obvious as a lot of these things probably are to those with the appropriate background the information is greatly appreciated by those of us to whom these things may not be so readily apparent. Clear, concise and useful advice. Plenty of people can design something attractive but it’s a real skill to design something instantly usable. I know that’s where I need practice. As a web designer who definitely didn’t come from an Art or Design background I am all too aware of the shortfall in knowledge. However the creation of web sites just keeps pulling me in. So articles as well written, comprehensive and challenging as this keep me going. Thanks for coming down and talking to us non-artistes. This article couldn’t have come at a better time. I have been recently trying to figure out the best way to arrange content for a site I’m designing and this article answered a lot of questions I had. Like others have said, Brilliant! I recently wrote an article on “Presenting with Professionalism.” Same ideas as this article, but yours is written so much better. Great Job! I’m an Attention Deficit Designer and you’re writings always keep me locked-in and retaining everything you say, to later use in my own work. With me, that’s a rare thing. An invaluable assemblage of know-how, perpetually useful. This is a topic many of us are haunted by. No wonder people develop attention deficit – the intellectual world can seem boring because there is too much attention to organized content and not enough to color and design. I found elementary school a wasteland – very little artistic opportunity. I was always an honor student anyway, but became warped and stifled. The art I had worked on by the day at age 5 was relegated to a dark corner when I entered school. Most websites achieve one facet while being faulty on the other. Your illustrations of what indicates emphasis graphically are important reminders. I actually read blogs based on pleasing design and smooth pageload more than on content. A well-designed blog or website has an ambience, which I think can inspire confidence in what the site has to offer. Since I have just recently given up searching out the latest hacks for browsers and now use Yahoo grids, I am pleased at the first results. I have put up a lightning banner this week, which I can see on quick analysis is subconsciously a reflection of spring storms here in TX but also illustrates my tattered synapses – hopelessly firing up new hacks for the past several years. I can’t believe I have a colorful logo and banner at long last. Let YUI handle the skeleton, and I can spend all my time on the skin and content that I may even have a little free time to think about. I’m glad to have this article for a reference. It comes just as I have shifted focus to design on my site and blog. Thanks. The longer I am working in the web design business, the more convinced I am that I am missing some very basic design skills. I used to think that graphic design and web design were 2 separate professions, but they both build upon what you call the basic rules (article “rules and context” on your personal site). The rules of contrast are among the basic rules that should be understood by all web designers. I hope you will contribute many more articles explaining other rules! Really enjoyed reading this one, really well written, as a non-designer it has given me a lot to think about! I look forward to reading further articles. Thanks, Andy! As another non-designer myself, this article does help clarify my own thoughts about communicating concisely with designers, as well as with clients who need help understanding the purpose of all creative aspects related to front-end Web production. Great article. I received my college degree in marketing, not art, and this article was very informative in showing how to bridge the gap between copy and design. As some of the posters above have mentioned, a good balance between content and artistic appeal is difficult to achieve, but you’ve managed to clarify it. Great article! Optimizr… I crapped my pants from laughing. But – you forgot about the wet floor effect (sic!) on the logo! Andy, your articles are always helpful. I was thinking of this very subject recently in preparation for a class I’m teaching in the fall. The more I think about design the more I believe contrast is the foundation of design and any other principles we may use are derived from it. This article reinforces what I had been thinking. I neither have an artistic background nor strong ability to communicate design ideas I every now and then come across at work. This article is a perfect example of how it’s important to be able to articulate a certain design choice to those involved in a design process, especially to a client. Thanks for the inspiration Andy. I must echo the other comments as I lack a strong understanding of the fundamentals of art and it makes communicating more and more difficult as I try to express more complex ideas. Combine that with the necessity to keep up to date with technology and it becomes a real challenge to concentrate more on the basics that are so important. Thanks, everyone, for the nice comments. I’m very happy that you’ve enjoyed and got something seemingly worthwhile from the article. I’ve not checked in here in a while and didn’t realize that there were so many comments since I was here last. “Universal Principles of Design,” by Lidwell, Holden, and Butler and “Painting Better Landscapes,” by Margaret Kessler. Both of these books can be quite valuable to anyone seeking a better grasp of design communication and human perception. I hope that some of you pick them up and utilize the great information within. Very nice article, I’ll most certainly be passing this on to some designers I know. i think that,s very nice work by you. As a struggling web designer without a design background, this article may have saved my career! All kidding aside, I think I learned more from reading this article than from years of reading so called “design” books. Thanks a lot! I have a problem with white and black colors. http://www.mwoa.ru/images/uploads/vemas.jpg – if you look at right part of image, where black menu panel meets shadow, you can understand that black panel is 1px smaller than white below… And that shadow is less bright. Who can explain me the reason why it happens or refer to an article I can read to unserstand such effect? “Universal Principles of Design,” is a great resource indeed, every designer should have it on their table. Thanks Andy, for this article, I will surely pass it on to my design team. Just wanted to say thanks for a great article. I often get so tired when designing a layout. I just want to get it done and move onto the building of the site, my favorite part. I need articles like this to help me persevere through it and make my designs/layouts more meaningful and purposeful. Your article was a great refresher and motivator. This is some good information. It’s important to think of web design as an art!